My first time in Austin, Texas – a city known for its unique culture (“keep Austin weird” tee shirts are everywhere), legendary live music, burgeoning restaurant scene, famous barbecue joints and honky tonks; and most of my time was spent on the 6th floor of the downtown Hilton in the food frenzy of BlogHerFood 2013. A few forays into the real Austin has me hankering for more and I’ll just have to find an excuse to visit again. In the meantime, I couldn’t wait to share a few takeaways from the conference. Takeaway #1 is a HOT TIP for summertime when the livin’ is easy and the fish are jumpin’ or, more likely, chillin’ with the kids at the pool or trying to stay cool on those steamy summer nights. Take Dole Frozen Fruit Cups, toss them in a cooler for a super chill snack that the kids will go crazy over – doesn’t melt like ice cream pops or popsicles and they’ll be getting a serving of fruit goodness. Mom and Dad can add your liquor of choice – the Pineapple Island includes rum and the Blueberry Vista gets grown up with gin and champagne, but feel free to create your own Chill Cup. Plus, you can stir up these chill cocktails in the fruit cup and have zero glasses to wash, only cups that are recyclable! Pour each ingredient over the pineapple and mix well or transfer to a larger glass to mix before pouring the cocktail back into the Dole cup. Pour each ingredient over the blueberries and mix well or transfer to a larger glass to mix before pouring the cocktail back into the Dole cup. Enjoy 🙂 And please drink responsibly. 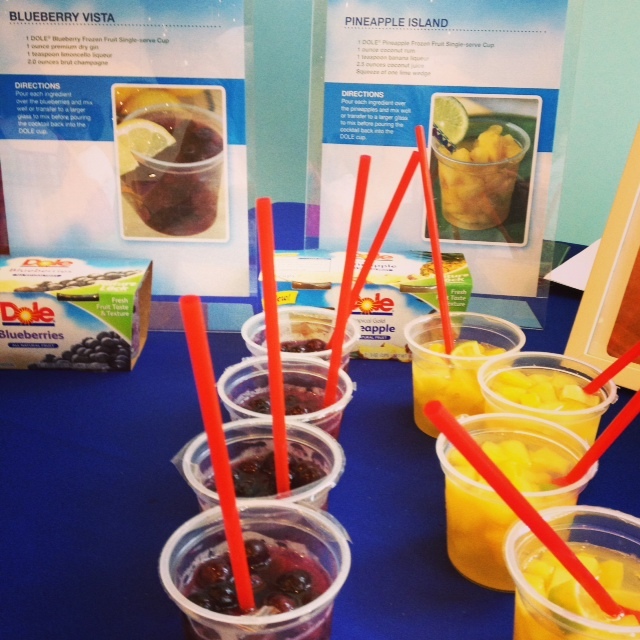 Recipes courtesy of Dole Foods. What a great idea! I agree with Liz, who knew! ?